Download "Employment. A Note of Caution"
1 Employment There are four possible ways that F-1 students can be legitimately employed, according to the BCIS regulations. Under the specified conditions, an F-1 student can be employed in the following ways: 1. On campus 2. Off campus by being granted Economic Hardship privileges. 3. Off campus by being granted Curricular Practical Training 4. Off campus by being granted Optional Practical Training A Note of Caution Working improperly or without authorization is a serious violation of your status. Due to several tracking systems now established in the US, working illegally can be easily traced by BCIS. This tracking is often used when a student re-enters the country, applies for Optional Practical Training or applies for a change in status (such as an H1B visa or Permanent Residency). A record of illegal employment will not only cause you to immediately lose your status, but it may lead to deportation and being barred from reentering the US for up to 10 years. Therefore, it is essential that you consider these ramifications and carefully read over the information provided here because it is ultimately your responsibility to comply with all Immigration regulations that apply to F-1 students. You can always ask the Director of International Education for guidance if you have any questions. EMPLOYMENT-ON CAMPUS An F-1 student who has been issued a Form I-20 by a specific university may work on that campus up to 20 hours a week when school is in session and full time (20+ hours) during the complete weeks when classes are not in session (this includes the ability to work in the summertime). In addition, a student who has been issued an I-20 to begin a new program and who intends to enroll for the next regular academic year, term or session at the institution that issued the Form I-20 may work on campus up to 30 days before their classes begin. An F-1 student may engage in any on-campus employment, but must not exceed 20 hours a week of work. If this occurs, s/he will automatically fall out of status and be terminated in the SEVIS system. It is a student s responsibility to keep track of his/her hours. For this reason, they should NOT allow anyone else to sign off on his/her timecard for them. This includes their supervisors! A student who falls out of status or is waiting for a pending change of status to F-1 is not eligible to work on campus until he/she is reinstated by BCIS. A student may not engage in on campus employment after completing a course of study. 2 ECONOMIC HARDSHIP The BCIS may process an application for severe economic hardship work permission if an F-1 student has been in status for one full academic year, is in good standing as a student and is carrying a full course of study. In order to apply for this, please follow the procedures listed below with the Director of International Education. 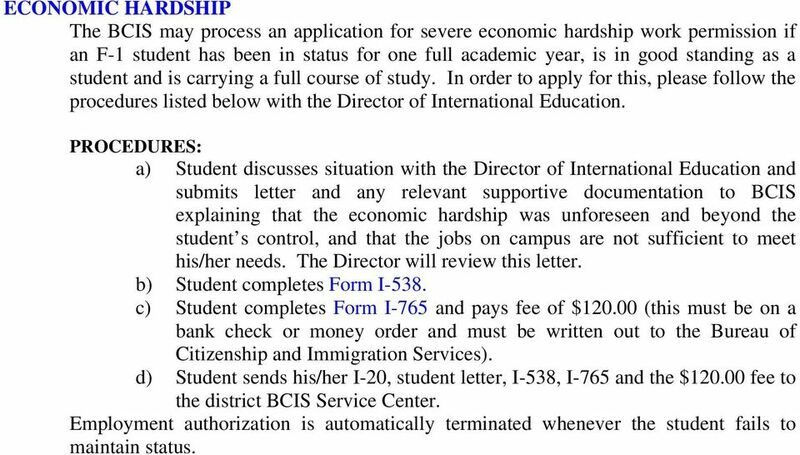 PROCEDURES: a) Student discusses situation with the Director of International Education and submits letter and any relevant supportive documentation to BCIS explaining that the economic hardship was unforeseen and beyond the student s control, and that the jobs on campus are not sufficient to meet his/her needs. The Director will review this letter. b) Student completes Form I-538. c) Student completes Form I-765 and pays fee of $ (this must be on a bank check or money order and must be written out to the Bureau of Citizenship and Immigration Services). d) Student sends his/her I-20, student letter, I-538, I-765 and the $ fee to the district BCIS Service Center. Employment authorization is automatically terminated whenever the student fails to maintain status. 4 the regular academic year. Your degree is the reason you are granted an I-20. Curricular training must be a part of your curriculum. Employment Eligibility Verification When you begin work, you and your employer must complete a form entitled Employment Eligibility Verification (BCIS Form I-9), which the employer retains. The I-9 must be updated each time you receive a renewal of you work permission. Your I-20 will have an employment authorization on page three. An employer does not have to meet Labor Department Attestation requirements when employing students under curricular practical training. Social Security and Other Taxes In general, F-1 students who have been in the US less than five years are exempt from Social Security (F.I.C.A.) taxes. Your earnings are subject to applicable federal, state and local taxes. Students must file a tax return on or before April 15 each year, which will determine if any of the withheld taxes can be refunded. An F-1 student on curricular practical training does not need Social Security and Medicare taxes withheld from his/her salary. 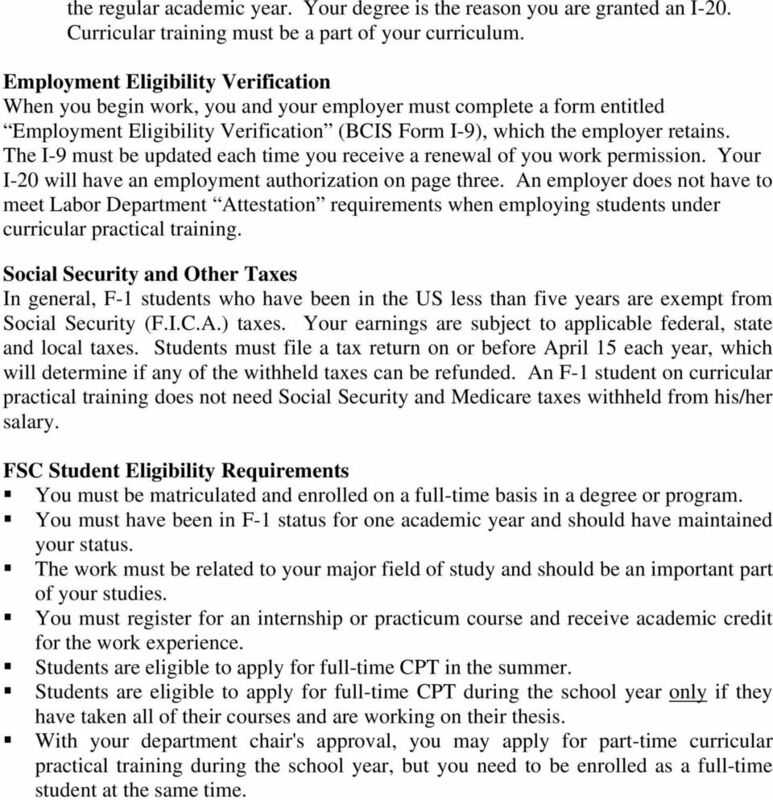 FSC Student Eligibility Requirements You must be matriculated and enrolled on a full-time basis in a degree or program. You must have been in F-1 status for one academic year and should have maintained your status. The work must be related to your major field of study and should be an important part of your studies. You must register for an internship or practicum course and receive academic credit for the work experience. 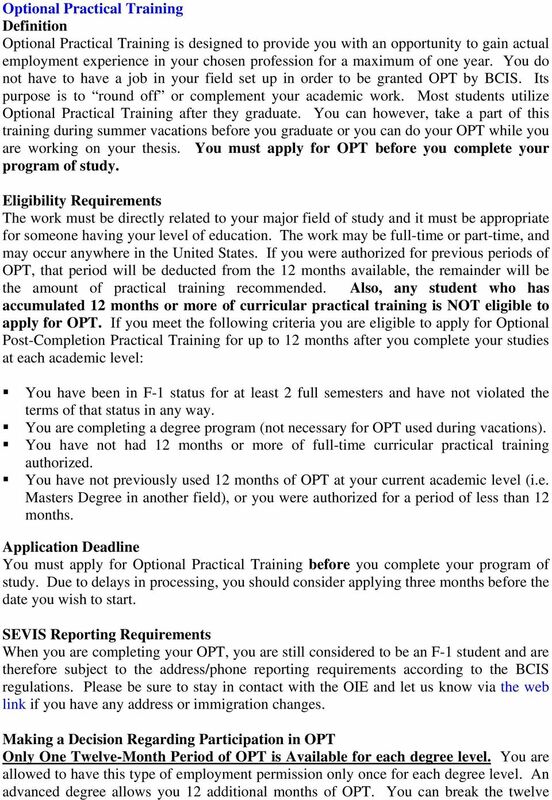 Students are eligible to apply for full-time CPT in the summer. Students are eligible to apply for full-time CPT during the school year only if they have taken all of their courses and are working on their thesis. 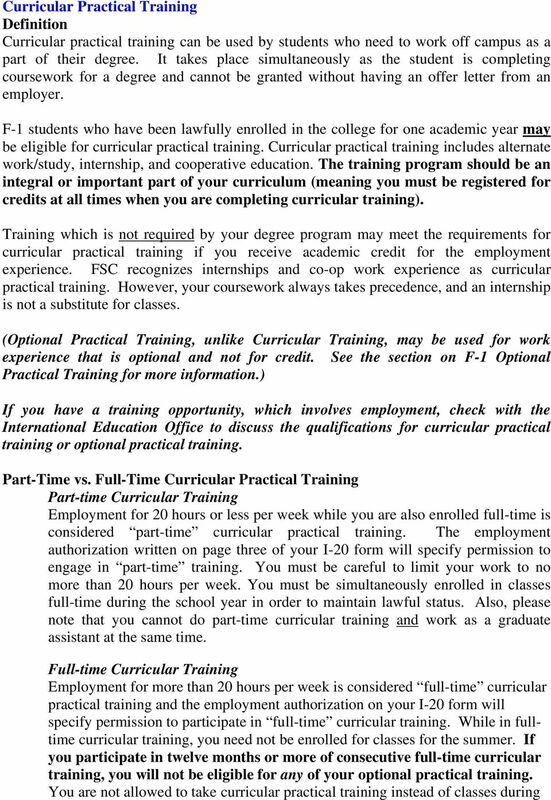 With your department chair's approval, you may apply for part-time curricular practical training during the school year, but you need to be enrolled as a full-time student at the same time. 5 Application and Authorization Checklist Students who wish to participate in curricular practical training must bring the following to the International Education Office: CPT Checklist Obtain an offer letter from your employer which states your title, responsibilities, and beginning and end dates of the employment. The letter must be on company letterhead with the company s address on it. If you are a graduate student, please fill out and sign the Graduate/Independent Study/Practicum/Thesis Form. Have it signed by your academic advisor or program chair. This form is available in the Graduate School & Continuing Education office and on the GCE website at Register for the internship by filling out a white Registration Card (also available at the same site). Pay for the internship. Drop this form, along with the Graduate/Independent Study/Practicum/Thesis Form and a copy of your offer letter to Jessica DuPont in the GCE. It will take her 3-5 business days to process. Complete the top section of a Department Approval Form (found on our website at Have your advisor complete bottom section and sign it. 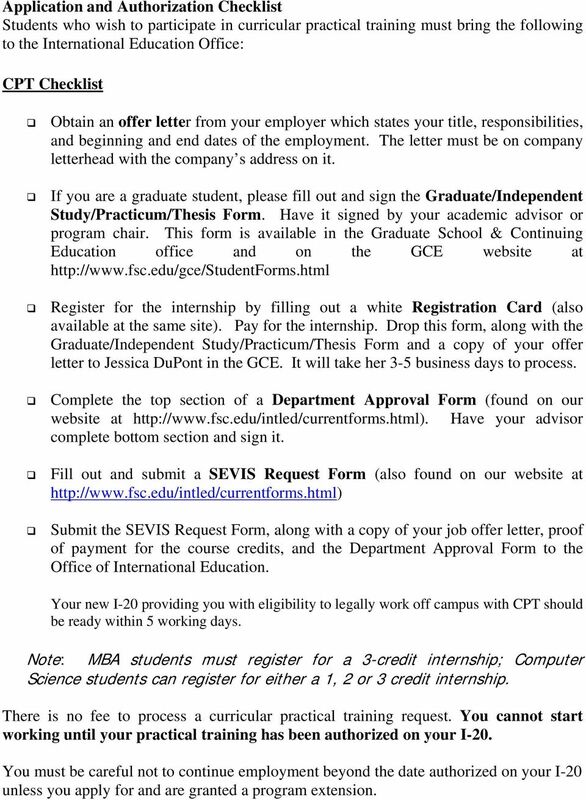 Fill out and submit a SEVIS Request Form (also found on our website at Submit the SEVIS Request Form, along with a copy of your job offer letter, proof of payment for the course credits, and the Department Approval Form to the Office of International Education. Your new I-20 providing you with eligibility to legally work off campus with CPT should be ready within 5 working days. Note: MBA students must register for a 3-credit internship; Computer Science students can register for either a 1, 2 or 3 credit internship. There is no fee to process a curricular practical training request. You cannot start working until your practical training has been authorized on your I-20. You must be careful not to continue employment beyond the date authorized on your I-20 unless you apply for and are granted a program extension. 7 months up into sections, but you have to pay the application fee each time you wish to use a section. If you obtain permission for OPT after a Masters in Computer Science degree, for example, and plan to continue study for another masters degree in a different area, you will not be eligible for OPT after completion of your second masters program. Only three types of F-1 students have OPT rights restored after those rights have once been used: (1) students who spend at least 5 months outside the US and return in F-1 status; (2) students who change from F-1 to another status, spend at least a year in the other status and then change back to F-1 status and (3) students who are going for a second, more advanced degree in the US. Authorization May Not Be Rescinded. Once authorization to engage in practical training after completion of studies is granted, it may not be rescinded or canceled. This means that after OPT is authorized by the BCIS, unexpected delays in completing degree requirements, inability to find an appropriate job or loss of a job may result in loss of otherwise eligible time to work. Once permission to work for twelve months has been given, it is gone regardless of subsequent occurrences. Actual Date Optional Practical Training Employment May Begin You will have a 60 day grace period before your F-1 status expires that can be used after you complete your program of studies (before your OPT) or after your OPT has ended. You should choose your dates according to what you believe is most realistic in terms of getting a job. You may not begin work until all three of following requirements are satisfied: (1) you have obtained an EAD from the Immigration Service, (2) the date is reached when the EAD authorizes employment to begin and (3) you have actually completed all requirements for your program of study. Change of Employer after Optional Practical Training Has Been Authorized You may change employers after you have begun authorized employment provided the new job is (1) directly related to your major field of study and (2) is appropriate for someone having your level of education. 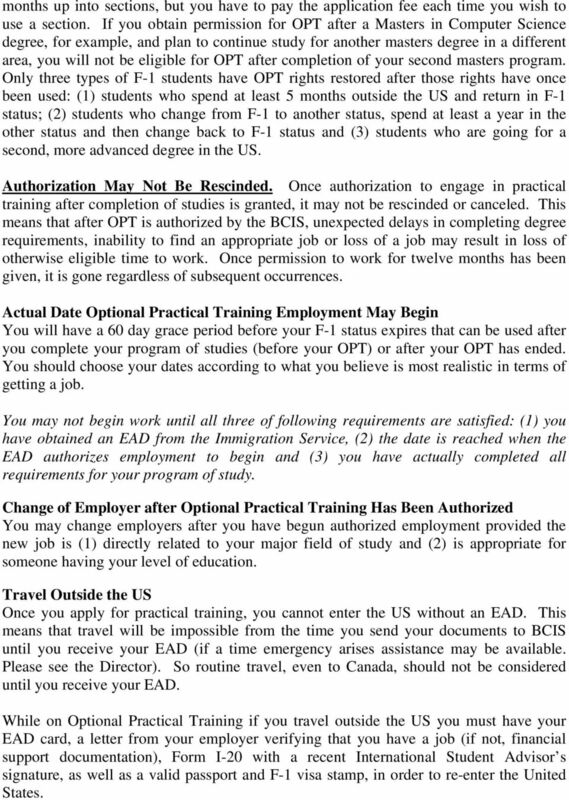 Travel Outside the US Once you apply for practical training, you cannot enter the US without an EAD. This means that travel will be impossible from the time you send your documents to BCIS until you receive your EAD (if a time emergency arises assistance may be available. Please see the Director). So routine travel, even to Canada, should not be considered until you receive your EAD. 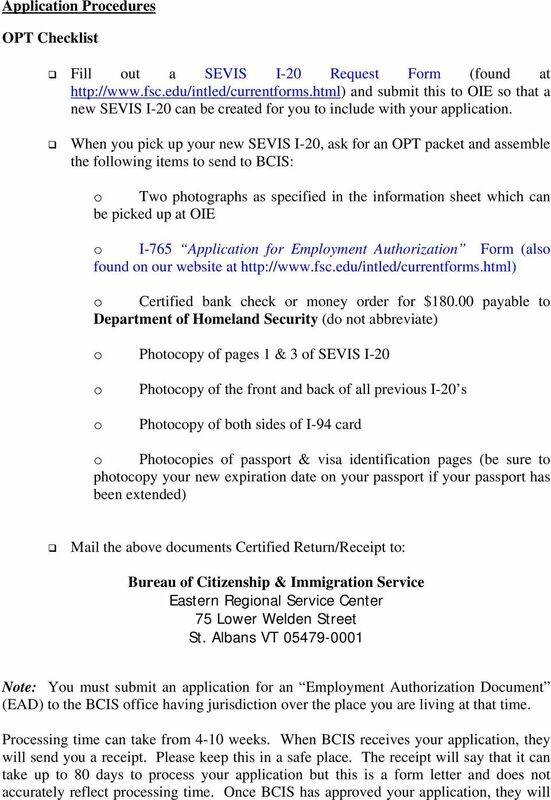 While on Optional Practical Training if you travel outside the US you must have your EAD card, a letter from your employer verifying that you have a job (if not, financial support documentation), Form I-20 with a recent International Student Advisor s signature, as well as a valid passport and F-1 visa stamp, in order to re-enter the United States. 9 send you your EAD. They will send it to the address you list on your Form I-765 so think carefully about the address you use. Official BCIS mail is not forwarded by the post office so if you move after applying, make arrangements with your roommates to deal with your mail or notify BCIS of your change of address. You cannot start employment until your application has been approved and you have received your Employment Authorization Document (EAD). DO NOT BEGIN EMPLOYMENT UNLESS YOU HAVE EMPLOYMENT AUTHORIZATION IN YOUR HANDS.